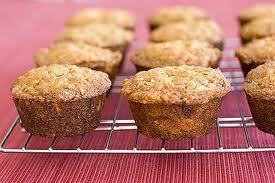 Morning Glory Muffins are super easy to make and will delight anyone who tastes them. They are light, not too sweet and go perfectly with a cup of hot tea or coffee in the morning. Because they are so simple and tasty, I often make them for our guests at The Lark Inn Guesthouses. This Recipe may also be found in our recipe book: Wedding Week at The Lark Inn. Let’s make some muffins! Preheat oven to 350°. Bake pecans in a single layer on a baking sheet 5 to 7 minutes or until lightly toasted and fragrant. Cool completely on a wire rack (about 15 minutes). Meanwhile, combine flour, salt, baking soda, ground cinnamon, and nutmeg in a large bowl; make a well in center of mixture. Whisk together sugar, canola oil, eggs, and vanilla extract; fold in crushed pineapple and carrots. Fold in toasted pecans and raisins. Spoon into greased miniature muffin tins. Bake at 350° for 20 to 25 minutes or until a wooden pick inserted in center comes out clean.